Please send me more information on Cabo Stand Up Paddle! 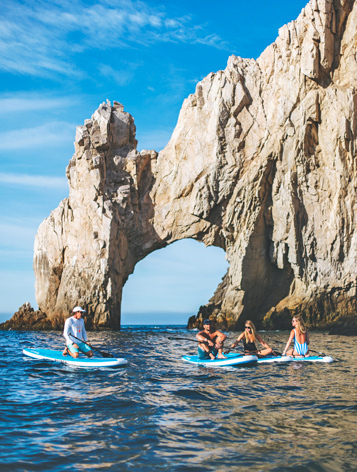 CABO SUP is the first Stand Up Paddle Board Club located in the heart of Medano Beach, Cabo San Lucas offers lessons, rentals and guided tours. Stand up paddling is the fastest growing water sport in the world. It is an amazing workout and a fun way to experience being on the water. After a safety lesson and basic instruction on the beach, you will head into the water on a training board to get acclimated and learn basic strokes. Once the lesson is completed, you are free to explore the waters of Medano Bay. Paddlers will be supervised at all times and will have contact with the certified instructors while on the water. Tour Includes: English speaking tour guide, snorkeling, jumping off Pelican Rock and instructions.